The Annual Public Meeting of the Barnes Wallis Memorial Trust takes place this week. The talks will all be held on 28 June 2012 at Howden School of Technology, Derwent Road, Howden, E. Yorks DN14 7AL, starting at 7 pm. 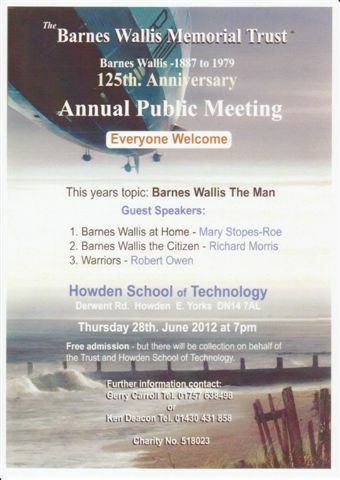 Admission is free, but a retiring collection will be held in aid of the Barnes Wallis Memorial Trust and Howden School.